A huge thanks to my lovely married couple Nuala & Colin for finding the time to share their story. I was honoured to be your wedding photographer and capture your relaxed and perfect wedding day. Thank you for having me along! Oh.. and my warmest congratulations with your addition to your lovely family. Can't wait to meet him soon. 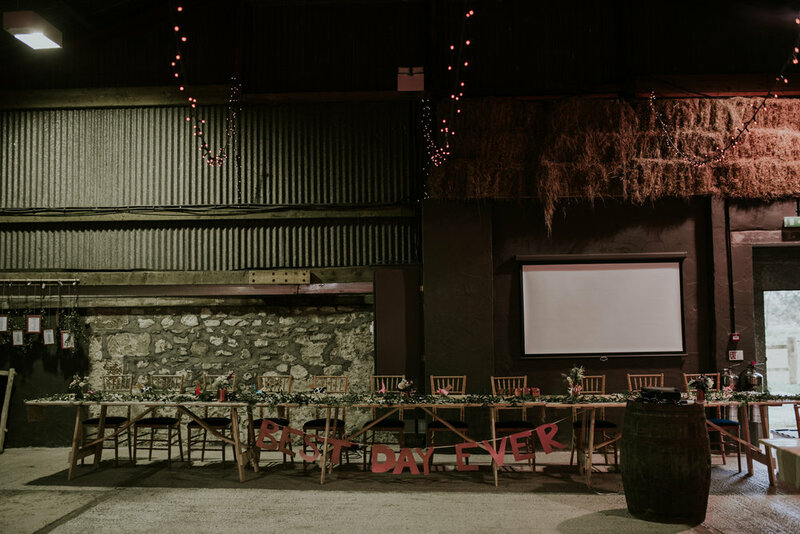 Scroll down to see the amazing wedding suppliers Nuala & Colin used for their farm DIY wedding. Olesja was the photographer for our wedding in October. From the first time we met Olesja we knew she was right for us. Her photos have a really natural feel to them, which is exactly what we wanted for our wedding photos. Olesja offers a complementary engagement shoot, which was great for us because neither of us are used to having our photos taken. Olesja was kind (and mad!) enough to agree to a trip to Glen Coe, which is one of our favourite places. 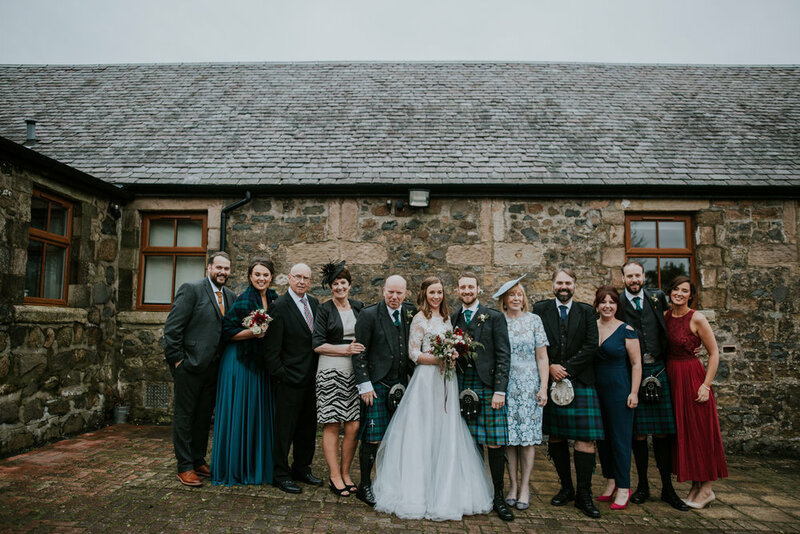 How was planning & organising our own farm wedding in Scotland? Colin & I knew we didn't want a church wedding, we were looking for something a bit different. We only had a few requirements; it must be big enough for all the guests we wanted to invite and it should be a wee bit unusual. 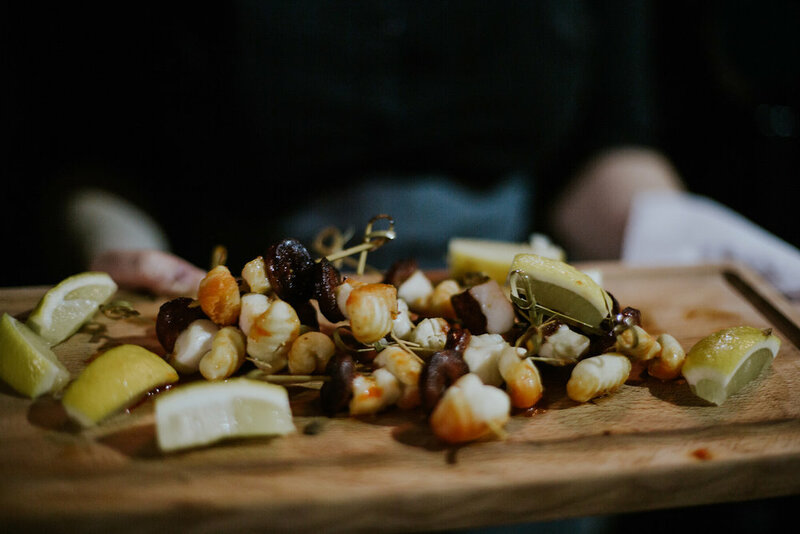 Firstly, we fell in love with a lovely venue in a remote part of the west coast, however, we hadn't worked out out final guest number (BIG mistake) and in the end it wasn't going to be big enough for us. Colin found Harelaw farm before they'd even had their first commercial wedding. When we visited the venue we fell in love with the setting but mostly the owners! Donna & George were so warm and easy going. We knew almost immediately it was the wedding venue for us. When choosing a wedding venue it's important to be flexible but go to visit venues with a few non-negotiable points. 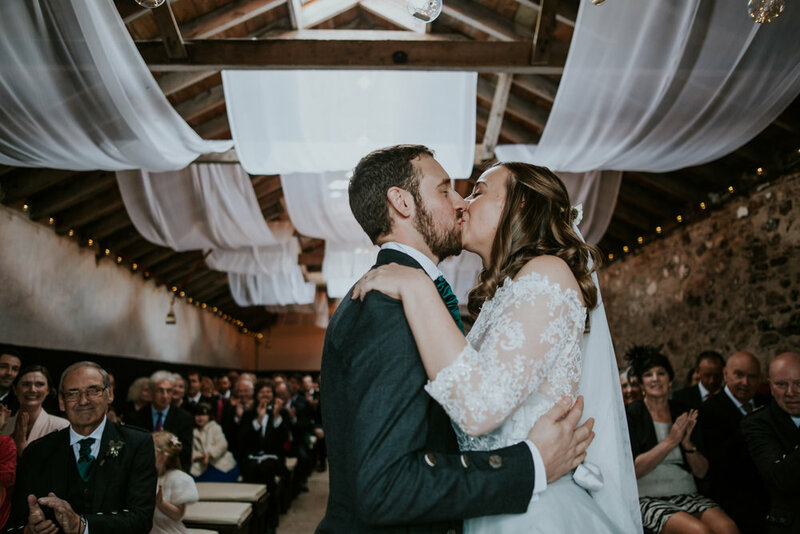 There are so many beautiful wedding venues in Scotland; you 'll be bound to find one that's perfect for you. I was heartbroken when we realised that the first venue we picked wasn't going to be big enough. 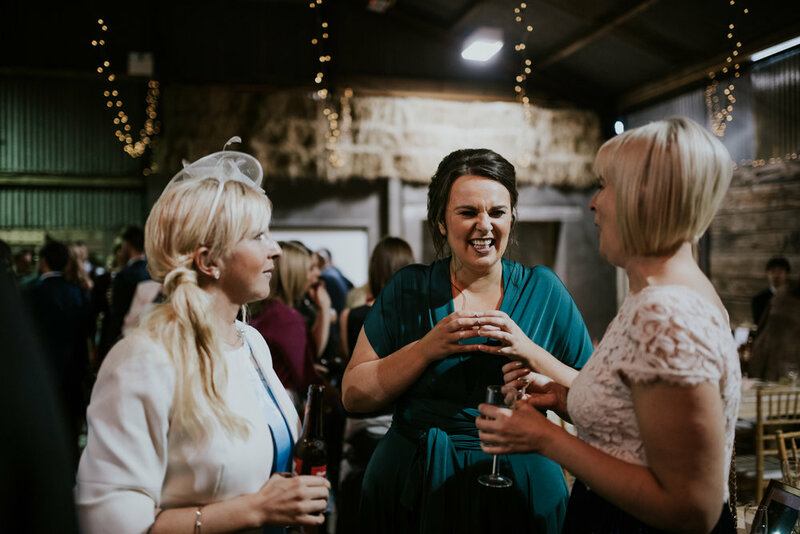 But then we found Harelaw farm wedding venue and I couldn't be happier with how the wedding went. it was the best day ever! After we found the venue we set about finding out wedding suppliers. The only thing that came with the package at Harelaw farm was the food so we had to book everything else ourselves. I was really excited about this part of the planning process.I started by searching blogs and found some amazing wedding suppliers. 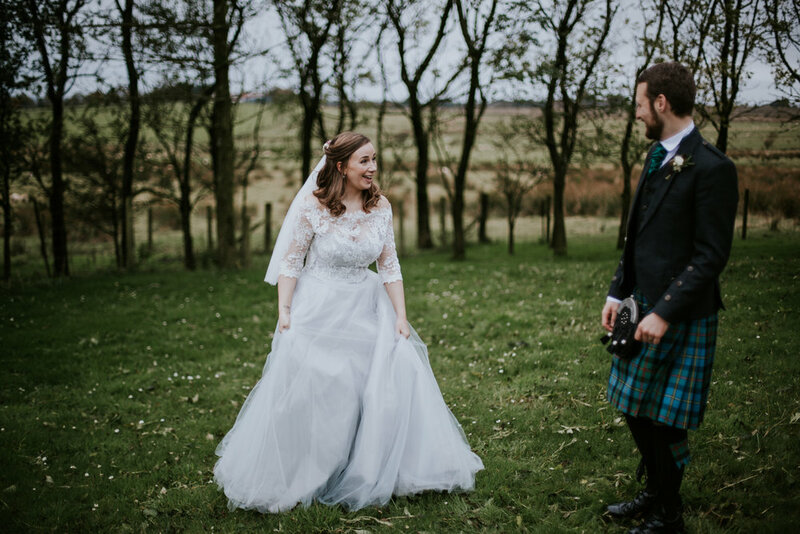 We booked our Glasgow based & destination wedding photographer first - Colin & I loved Olesja's natural, relaxed and creative photographic style and her personality. She was an absolute star on the day as well. 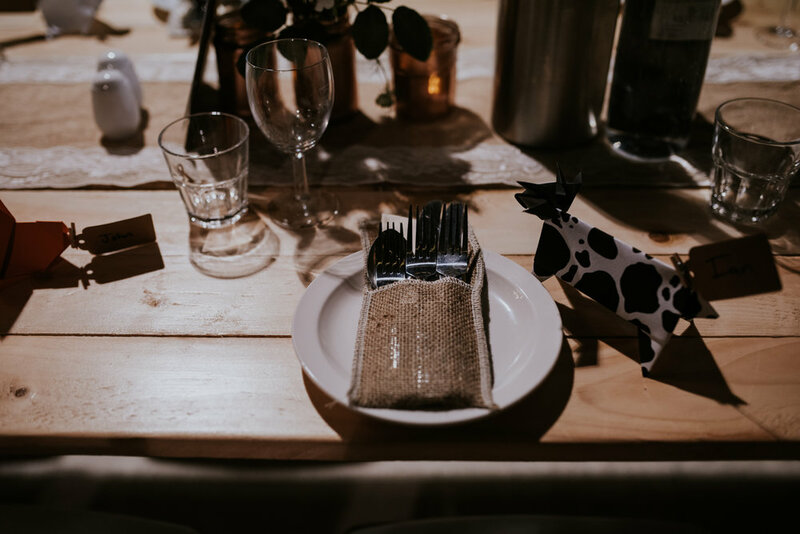 Our wedding florist, Mel at Briar Rose Design was understanding of our budget requirements and provided us with beautiful bouquets, buttonholes and centerpieces well within budget. She as s super talented wedding florist and she was lovely to work with too. She really helped me when decided what I wanted my wedding bouquet to look like. Colin's only request for the wedding was to make sure the band were really good. We decided early on that the party part of our wedding was very important to us. We wanted everyone on the dance floor all night! 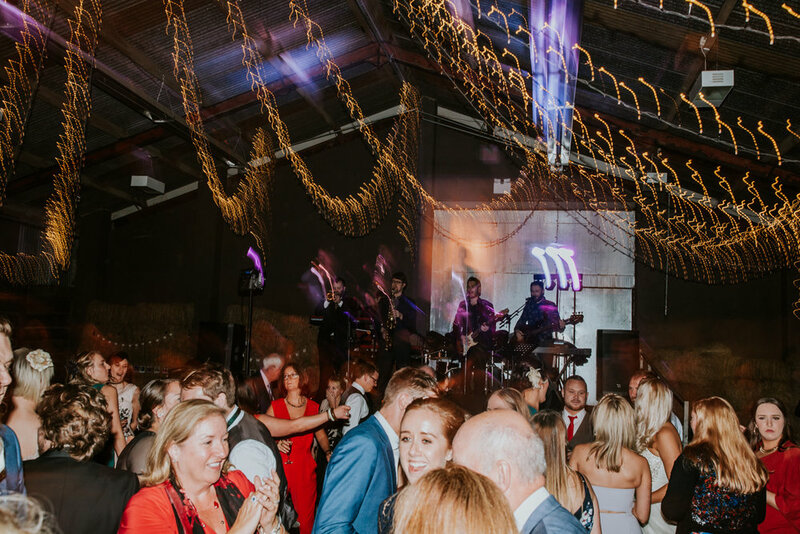 We found Nick Bruce and his Blinding Lights on the wedding collective. Colin went to see them rehearsing and knew instantly they were the band for us. He said the drummer was amazing and that was the selling point for him! On the day, the band came to Harelaw farm to do the sound check in the morning, so as no to interrupt the post-dinner chats. This was so kind of them to accommodate our needs. The night of our wedding was one I won't forget, the band were fantastic! I was on the dance floor most of the night as were most of our guests and loads of people commented on how good they were. Colin and I knew early on that there would be a lot of DIY and crafting for our wedding. We ended up designing and creating our own wedding invitations; Colin even designed a purple and gold origami envelope for each invite to go into. I still can't believe we managed to pull that off. I also created our wedding table plan which I took inspiration from a wedding fair I went to. Colin also made the name cards, but being Colin he didn't do it the easy way. He decided to make origami animals - a cow,pig, sheep, bunny and hen. So many people took them home with them and commented on how unusual and lovely they were. Colin spent many nights folding paper and getting paper cuts; it was all worth it though. 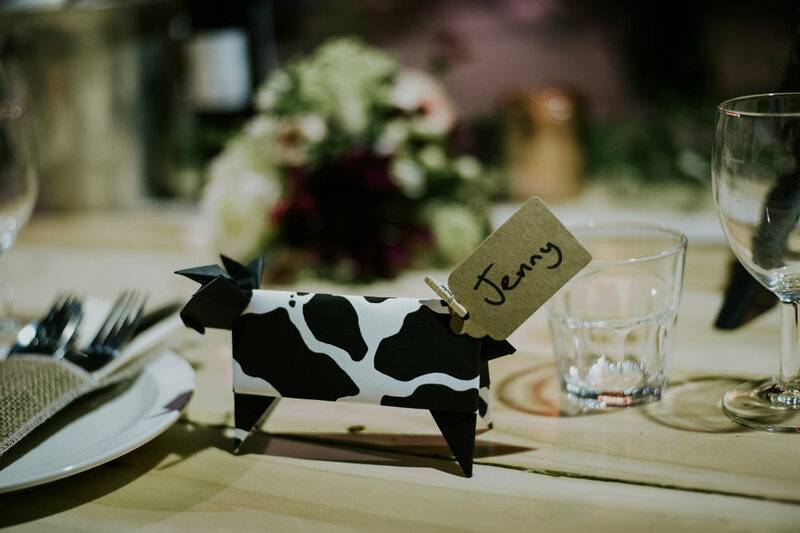 Family members also helped us out making the cards box, the order of the day, a flower hoop, bunting and decoration for the barn and my aunt created some beautiful floral decoration for the ceremony byre. My mum also made the wedding cake, which was delicious, and a beautiful, simple drape to frame the window we got married in front of and my dad made a gorgeous sign of all the locations that our guests had come from. If you have the energy and time I'd definitely recommend doing some DIY or crafting for the wedding day. We really enjoyed doing it and it added such a personal touch to our wedding day. I think we probably saved a bit of money too. After having stressful and anxious times in bridal shops my friend recommended going to see Wendy at Flossy and Dossy. After our first meeting and describing the dress I wanted, I knew it was the right path to go down. Over the following months leading up to the wedding I saw Wendy about once a month and I found the whole process of design the dress, choosing fabrics, colours and lace very organic. Wendy was great to work with, very laid back and I always felt relaxed when I visited her; the exact opposite of the way I felt in the bridal shop. I 'll never forget wearing that dress on my wedding day. I felt amazing and the look on Colin's face was great! I went for a bluey/grey colour and I loved it! 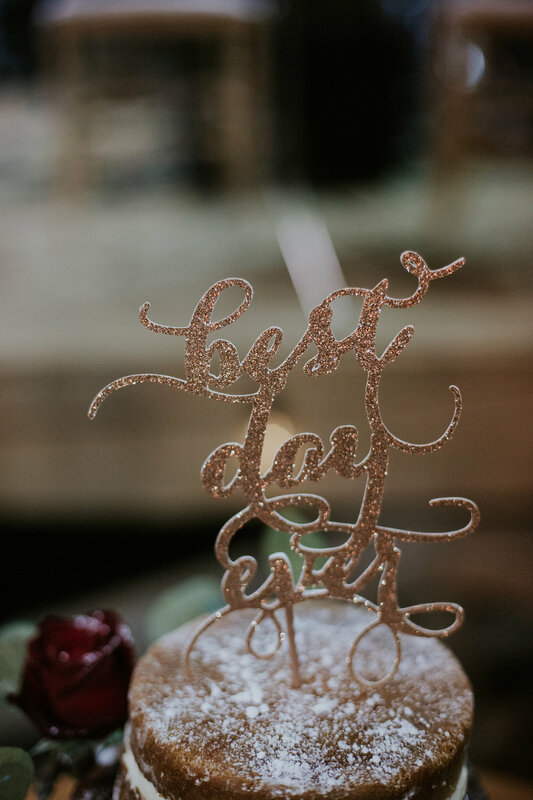 I can't thanks Wendy enough, it was my favourite part of planning the wedding and I'd do it all over again in a heartbeat! I 'd really recommend finding a talented dressmaker like Wendy to make your wedding dress. The whole process was so much more chilled out than the traditional bridal shop route and I really enjoyed the creativity of it all. The morning of the day was very chilled out. Colin and his family were at one side of the farmhouse and my family, bridesmaids an I were at the other end so Colin and I didn't see each other until I was walking down the aisle with my dad. My MUA and hair stylist arrived and we started getting ready. JoJo and Holly were lovely and totally accommodating to my requests. I ended up with very simple make up but I loved the look that JoJo created and felt like a million dollars. My only advice for the morning of the wedding is just to enjoy it. I started to get nervous when my dress was going on and I just wanted to get going - in the end I was 5 minutes early! Just be yourself and do what feels right for you. It's your day after all!